The Hawaiian Outrigger Canoe was developed by the indigenous people of pae ‘aina (Hawaiian Islands) for two thousand years. Outrigger canoes and their counterpart, double-hull, have developed over time mainly for open ocean conditions in the Hawaiian Islands. Canoes were used in many ways, just as we use automobiles today. From racing cars to heavy trucks for moving goods to buses for transporting people. In Hawai‘i, the ocean was the highway for those who could afford it. Outrigger canoes used for fishing were relatively small with a small crew of two or three. These banana-shaped canoes had a large bottom to hold the catch. This small size and curved shape is also useful for surfing as they are very maneuverable and the shape lessens the chance of pearl-diving. Racing probably started when fishermen challenged each other to be the first in to offer prize fish to their chief. A racing canoe and crew was expensive. 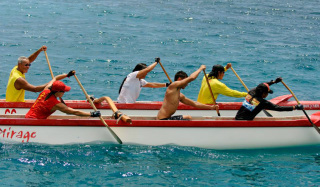 The racing canoe was called hei hei wa`a and was similar to today's racing canoes. This was also a term of endearment to a beautiful woman; long and sleek with a widening rear end. One nickname for Ka‘ahumanu was “Hei hei.” She was considered the most beautiful woman anywhere (at age 18) by Vancouver when visiting Kamehameha. Often, noho (canoe seats) were named for a particular paddler who occupied that seat rather than #1, #2 etc. 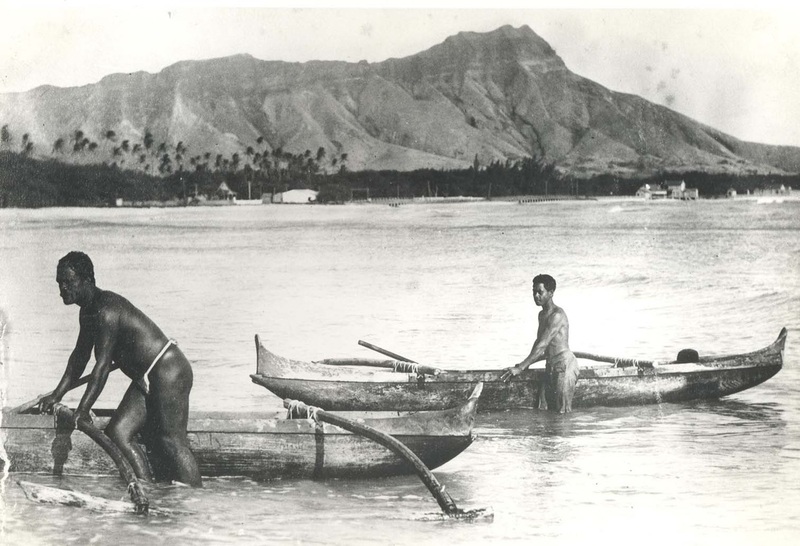 One of the favorite paddlers of Kamehameha was a Ho‘okele (steerer) by the name of Kainaliu. His name lives on at an ahupua‘a (land division) and community by the same name in Kona, Hawai‘i Island. 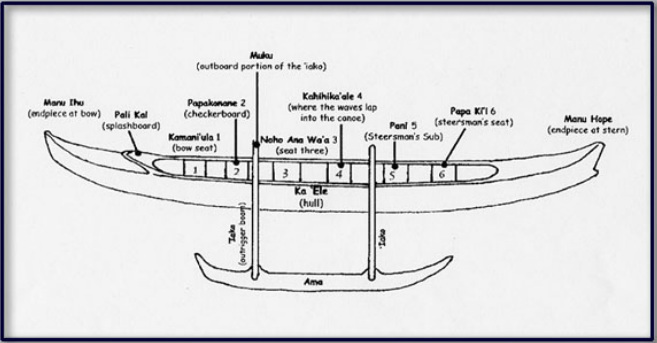 Kainaliu literally means “bail the bilge,” Ka being the bailer, so we know he was at least in the canoe. By the way, Kona means leeward and there is a Kona district on every major Hawaiian Island except Maui. Waikiki and its adjacent areas is the old Kona side of O‘ahu. Chiefs raced against each other, often betting on the outcome. This betting practice eventually led to banning of racing by Ka‘ahumanu under influence of the missionaries. Long before the missionaries arrived, Kamehameha lost interest in canoes when he foresaw the coming of Western Trade. He also found Western sail sets more efficient with the ability to sail closer to the wind using fore-and-aft sails with gaff rigs and ketch sail shapes. Western vessels could carry more goods with a similar sized crew of a double hull. Kamehameha became, after uniting the islands by warfare, primarily a trader. The thousand peleliu double-hull and outrigger canoes built for the amphibious invasion of Kaua‘i then sat rotting in O`ahu sun. Most of these were made of koa trees from Hawai‘i Island, denuding the forests. However, many were carved from other woods, including driftwood spruce from Northwest America. References: The Hawaiian Canoe by T. Holmes, Hawaiian Antiquities by David Malo, History of the Hawaiian People by Abraham Fornander, Ruling Chiefs by S.M. Kamakau and M.Pukui. On the start of any race, change count called on 19. The first 3-4 strokes are a natural longer reach, blades buried, quick strokes progressing to shorter strokes (not dips) arm paddling strokes that are rapid and quick without much recovery at the end of each stroke. Intensity is at 100%. This is to get the canoe hull up and get it moving forward with thrust. By the middle of the stroke count of the second change the stroker is starting to extend the reach. By the third change over has made the transition to the full stroke. The transition between the short and the transition stroke should not be a marked difference in pace. It should not feel like two completely different strokes. If you have a lot of time between each stroke it probably means the stroke needs to increase to achieve a minimum of 64 strokes per minute. “Take it up one, two, four"
This refers to the stroke count. Since the stroke count is measured in strokes taken per minute. If it’s up one that’s just a little faster, if it’s up two than increase your stroke by about 2 strokes in one minute and etc. Four changes calling the count on 9, to change over on 10. This is normally done to get a jump on a canoe next to you, near a finish line or racing long distance. It means every paddler is concentrating on a deep and powerful stroke with maximum intensity, still reaching but it should be slightly quicker due to shorter changes. This call is usually made by the steersman or number 2. It can also be six hard, eight hard etc. Usually called by number 2 or the steersman in a regatta race when close to the finish flag anywhere within four changes to the flag. This lets everyone know to give it all they got all the way to the end, focusing on their own paddling of power, depth and reach. Usually called by number 2 or the steersman when very close to the finish line indicating that the crew will paddle all the way through the flag without making a change as the change could cause the crew to lose at the finish line by a split second. You may have to paddle 20-40 strokes on one side. Usually called by the steersman when a swell is lifting the rear of the canoe and with some extra power from the crew we could get propelled forward to our advantage. While our canoe okole is lifting, the crew takes 2-3 powerful, shorter, quicker strokes to try to catch that swell. When catching the swell, feeling the lift, the caller should not call a change until after the swell has passed and the boat slows again. This gives the crew as much as advantage as possible to work the swells. Not used frequently, but can be called by the steersman in an attempt for the crew to match stroke for stroke another canoe that is close in a race-- when the competition’s canoe is forging ahead. From the corner of their eye the stroker paces with the other canoe’s stroker pace to see if it will improve their position. Paddlers put their paddles in the water at a square angle to hold the boat from drifting.